Getting your groomsmen together for quality time has never been smoother. “It’s like playing a round of golf, only it doesn’t take as long and it’s not as expensive,” says The Shave of Beverly Hills’ owner Paula Malcolm, who has seen an increase in grooms coming in for a classic barber shave as a part of their celebration. ✦ Keeping stride with the trend, the Art of Shaving’s flagship shop (prices begin at $35), which opened this past December, will join existing 90210 hot spots The Shave (prices begin at $50) and The Brighton Shave Co. (prices begin at $40). 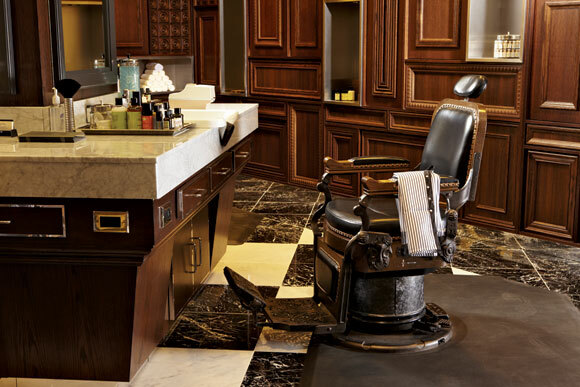 At the Art of Shaving, grooms lean toward the signature Royal Shave ($55), which features a facial massage with preshave oil followed by the perfect shave—a process repeated twice, once with the grain and the second time against the grain. The process is finished with a mask, hydrating toner and after-shave balm. And with guy-friendly amenities (Brighton even has a pool table) and drinks on demand, these manly sanctuaries are the perfect place to treat the groom and his party to some well-deserved pampering usually reserved for the ladies.